Like many other states across the US, Washington is expected to experience a shortage of qualified nurses by 2025. In terms of LPN counts, the state will be short 1,200 nurses. Although this is a concern for health care professionals and leaders, as well as Washington residents, it could mean promising opportunities for those looking to work as a practical nurse in the state. 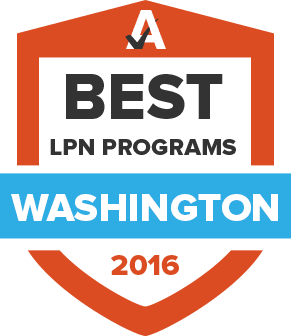 Those who are ready to take the first step towards this challenging yet rewarding career can use the following guide to get more information on LPN programs in Washington, licensing requirements for employment, and state salary outlook. LPNs must be licensed in order to practice. Each state has its own requirements; it is very important to understand these requirements before applying for licensure. Here’s what aspiring nurses can expect in Washington state. Graduating from an approved LPN program takes less than two years and as little as one, depending on the school. Graduates who have completed the program should ask their school to send an electronic certificate of completion to the Washington State Department of Health Nursing Commission. Unlike many other states, Washington does not honor the Nurse Compact Licensure Agreement. This means that a license to practice as an LPN in Washington is good only in that state and does not allow for practice privileges in other states. LPNs must pay $96.00 to renew their license each year. There is an additional $50.00 charge for a late renewal. Renewals may be submitted online, by mail or in person. There is a $2.00 convenience fee for renewing online. LPNs in Washington can look forward to a good living wage, as evidence by the charts below, which compare not only wages within the state and metro areas, but against the national averages as well. The need for LPNs in Washington is expected to be strong, growing 16.8% between 2012 and 2022, according to Projections Central. This amounts to an increase of about 1,400 jobs over that time period. As an added bonus for graduates of LPN programs in Washington, the 2014 median wage for LPNs in the state was notably higher than in the rest of the United States. NWone exists to advocate on behalf of nursing leadership at all levels and in all practice areas, in both the private and public sectors. The only nursing organization dedicated to the interests of student nurses at all levels in the state of Washington. SNOW represents school nurses and their mission to improve the health and academic success of students. The Nursing Commission is charged with protecting the public by overseeing the licensing of nurses within the state of Washington.